heehee. looks like my stove needs a clean. please excuse the mess! It’s Totoro Week! If you know me at all, you know that I’m a wee bit obsessed with Hayao Miyazaki and in particular, Totoro. He’s furry, he’s friendly, he’s absolutely adorable. It’s been my lifelong wish to meet a totoro in real life, but since that will never truly happen, me and Lyndsay of Coco Cake Land decided to make (and eat!) a bunch of totoro inspired food. 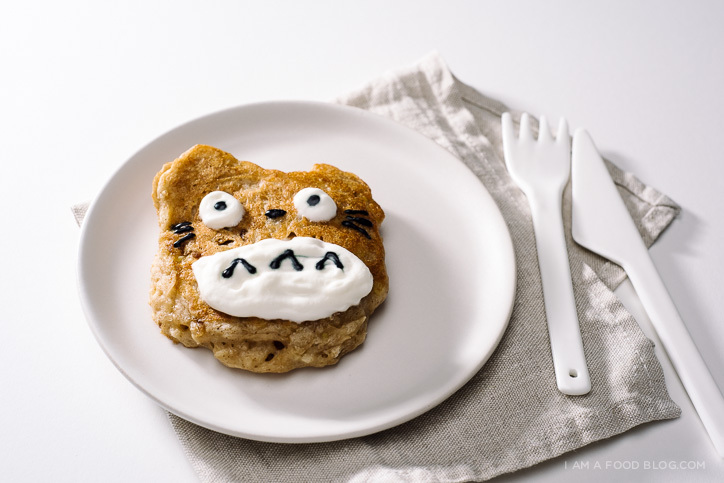 As a kid, heck, even as an adult, my brunch would be MADE if someone gave me a plate of Totoro pancakes. It would be even better if they were apple pie pancakes made with shredded apple, cinnamon, buttermilk, and all the good stuff. I know it’s a little finicky to decorate your pancakes, so if you just make plain apple pie pancakes, I would totally understand. To be honest, I only made three of these guys before resorting to regular fluffy rounds. Do you guys find it meditative to make pancakes? I love standing by the stove waiting for those little bubbles to break the surface. Way better than heading out in the inevitable Sunday morning rain to wait in line for brunch. Plus, making pancakes at home means that I can eat them right as they come out of the pan. Minimal time from pan to stomach is my ideal kind of Sunday. Hope you guys are having a happy one! In a large bowl, whisk together the flour, baking powder, baking soda, sugar, and spices. In a small bowl, whisk together the buttermilk, egg, vanilla, and apple. Add the wet ingredients to the flour mixture and gently combine with a fork. Do not over mix. This is a thick, lumpy pancake batter. The little lumps will make your pancakes fluffier. Let the batter sit for 10 minutes some moisture works its way into the lumps. Heat up a non-stick pan over medium-low heat. Brush a thin layer of butter or oil on your pan. Drop the batter by the tablespoon into the pan and cook until small bubbles form on the surface and at the edges. The pancakes should be a golden brown. Flip and continue cooking for 1-2 minutes, or until golden brown. Remove from the pan and place on a wire rack inside a baking sheet. Keep the cooked pancakes warm in the oven until you finish pancaking. To make totoros: spoon the batter on your lightly greased pan and maker sure to spoon on two ears. Use whipping cream to spoon on a belly and two eye whites. Pipe on melted chocolate or black frosting for the eyeballs, nose, whiskers, and tummy triangles. PS – Check out Lyndsay’s Totoro cake! He’s super kawaii! 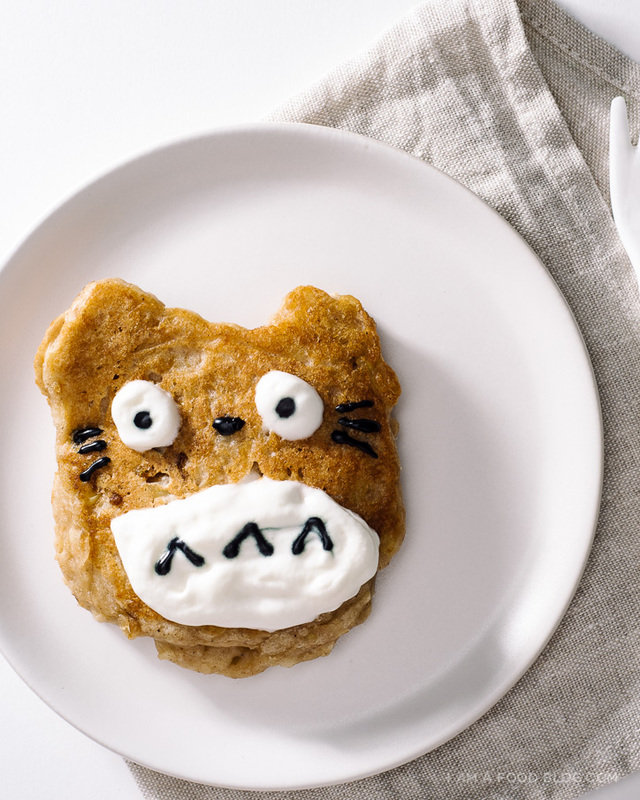 Umm…apple pie Totoro-themed pancakes?!?! AHHHHHHHH!!! This is the best. This is the cutest thing I’ve seen all day! Amazing! So adorable! Where did you get your knives & forks? Thank you! 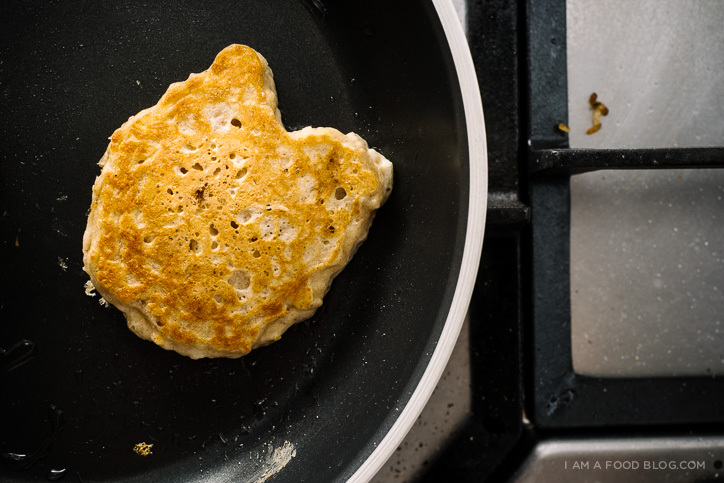 Oh my goodness, these are the cutest pancakes I’ve ever seen in my life. OMG I CAN’T EVEN. this is too cute Stephanie! 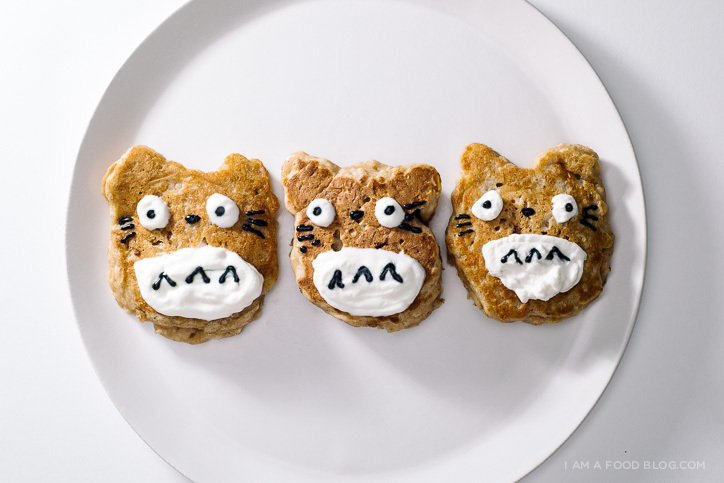 I’m such a Hayao Miyazaki and Ghibli lover – I watch the new films every year in Japan ^.^ But OMG I have to make these for a brunch party! 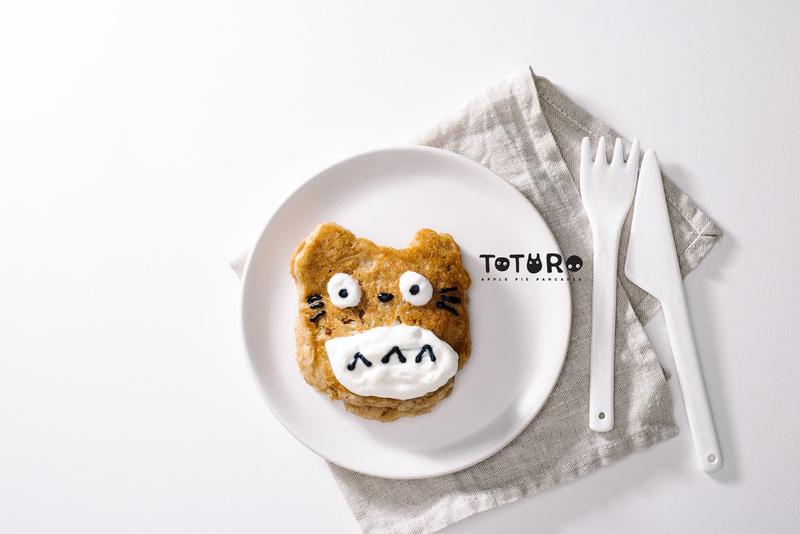 totoro-themed food is the best! O yea! O yea! O yea! Apple pie pancakes …I’m so hungry and so happy for this recipe :) Enjoy a restful Sunday, Stephanie! I’ve never heard of a Totoro, but he’s cute! And your pancakes look yummy, too. Ahhhh!! I am so in love with totoro and these pancakes!! A.d.o.r.a.b.l.e. Brunch is my favorite meal, because it means you can have a mimosa at 10:00 AM ;) These pancakes look amazing! i didn’t know there was any such thing as a totoro week, but i’m really excited to find out from you. cheers! Omg this is so cute and actually pretty simple to do! Thanks for the inspiration. Mmmmmm those look delicious!! I love making apple biscuits for breakfast and this would be a yummy change of pace. Can’t wait to try these!